The “Noble” Bodhisattva who expounds the Buddhadharma in this sutra is no ordinary one. Avalokiteśvara is a Bodhisattva of the tenth stage (bhūmi), and as such, is an Ariyan—one of distinguished Spiritual-Stature whose inner-teachings radiate with the Unborn Light of Noble-Wisdom Itself. Avalokiteśvara is also a true Warrior of this Liberating Light—destroying all forms of ignorance (avidya) that stand in the way of those who aspire towards Bodhisattvahood; in so doing Avalokiteśvara is also a Heroic-Being (sattva) contemplating the Undivided Light of the Bodhi-Mind. 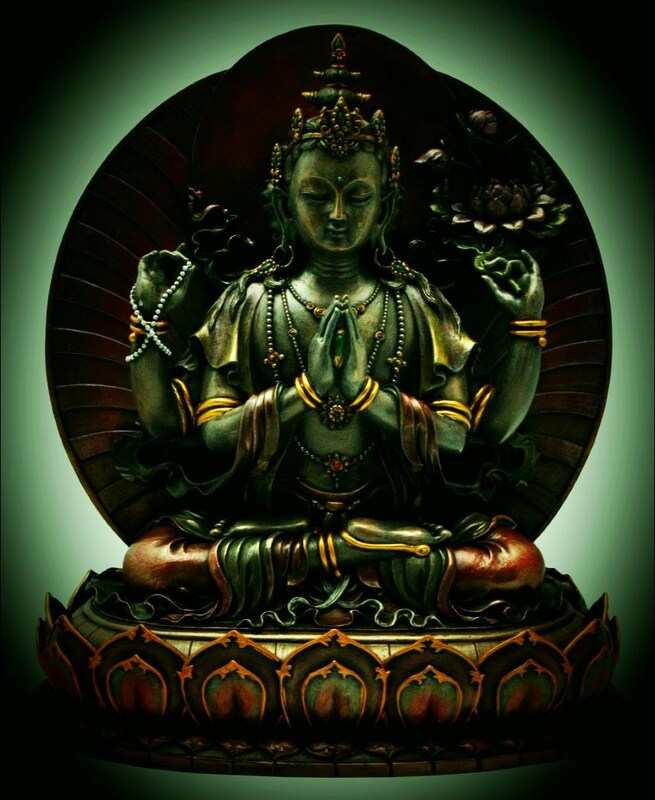 Of course over the millennium Avalokiteśvara has taken-on both masculine and feminine characteristics, in either case the name strongly suggests “”He/She Who Looks Down Upon the Sounds (Cries) of the World.” (ibid, pg.44). In light of the Heart Sutra, Avalokiteśvara is the brave-Noble Light-Warrior who looks-down upon those who are entrapped within Māra’s domain, (skandhamāra) as exemplified in the five-skandhas. Soon he will fully expound on the only way to break free from Māra’s spell. Shariputra: like in most Mahayana Sutras, Shariputra represents the wisest of the Buddha’s Hinayana disciples; yet he must always have the sublime teachings of the Mahayana expounded to him, oftentimes ad infinitum—like in the Vimalakirti Sutra wherein he comes across as a fool. One shouldn’t be too harsh on him, though, as the Buddha once prophesized in the Lotus Sutra that Shariputra will eventually become a Buddha named Padmaprabha. But here in the Heart Sutra although his present-wisdom is advanced, he still lacks the greatest crown-jewel of them all—the Perfection of Noble Wisdom. When both Avalokiteśvara and Shariputra mention, “a son or daughter of a good family”, they are not referring to some human lineage. Rather, they are alluding to the “Family of Buddhas.” Yea, it is only after ascending through the ten-fold path to Bodhisattvahood that one can even begin to consider the Perfection of Noble Wisdom. This perfection is only self-realized after the gotra (the seed of the Buddhas) reaches fruition in the garbha (womb) of the Tathagatas; it is only then that the gateless-gate to Deathless Suchness is opened thus permitting entrance into the Sublime Unborn Family of All Buddhas. If one aspires to enter through this imageless-portal, then one must first overcome the five evil guardians (Skandhas) that bar the way; one begins by discerning that they are Empty of the Substance that constitutes the Right Stuff of Bodhisattvahood and Tathagatahood. This entry was posted in The Heart Sutra and tagged Bodhisattva, Light Warrior, Lord Avalokiteshvara, Noble Wisdom, Shariputra, Wisdom. Bookmark the permalink.